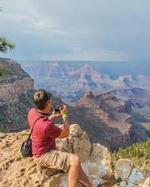 Find everything from a Grand Canyon tour to exciting Colorado River float trips right here! The Grand Canyon area of Arizona provides a beautiful, varied view of desert scenery that is sure to make your next vacation to the southwest a truly memorable experience. Take your sweetheart on a nature lover's honeymoon with the Grand Canyon Honeymoon Getaway package, including three nights of lodging in the area, you'll have everything you need to enjoy the beauty of the outdoors together.